The 2016-2017 season marks GERRY DOAN’s thirty-fifth season and final season as CCO’s conductor and musical director. 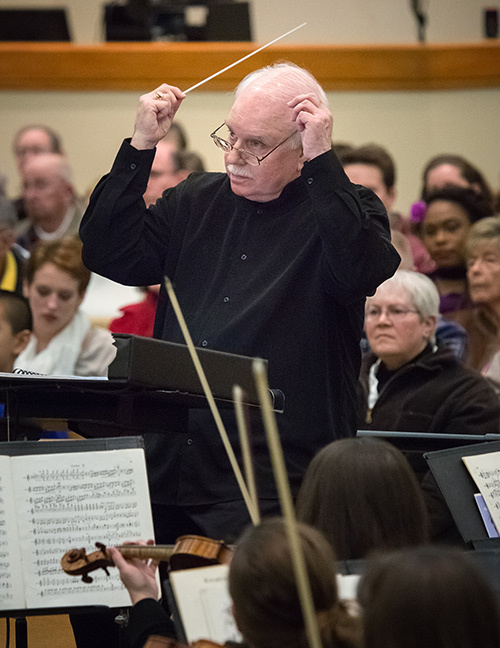 Under Dr. Doan’s leadership, the CCO has undergone tremendous growth in both membership and musicality, tackling works that were once thought to be “too difficult” for a community orchestra. He has lead the CCO in well over one hundred performances at multiple venues and with dozens of Cincinnati’s best professional soloists. He helped CCO celebrate it’s 50th anniversary in May of 2004 with a gala performance at CCM’s Corbett Auditorium. His time as Musical Director has introduced nearly 500 new compositions and almost 100 new soloists to CCO’s members and audiences. In another life Gerry taught school musicians for 38 years before retiring in 2003. For 24 of those years he was Professor of Music Education at the College-Conservatory of Music, University of Cincinnati, where he trained band and orchestra directors. He continues as conductor of the preparatory department’s Cincinnati Junior Strings orchestra (for 9 to 14 year old musicians). He has conducted that group during tours of New Zealand, Australia, Hong Kong, Singapore, China, Malaysia, England, and Ireland. Dr. Doan also conducts each January at the Pan Pacific Music Festival in Sydney, Australia and has served as Conjoint Professor of Strings at the Newcastle Conservatorium of Music. “Leftover” time is spent as a professional violist, a studio teacher, and as an arranger of works for string orchestra. Gerry’s educational background includes degrees from Ohio Wesleyan and Ohio State Universities. He taught in the public schools of Bedford/Mt.Kisco, N.Y. and Marion, Ohio before turning to college teaching at Ohio State University, Adrian College (Michigan), and at CCM.